For a commercial site, and with the proliferation of online payment services, you may need to have buttons showing the logos of Online Payment Service Providers. Here is a set of 75 Free Buttons For Online Payment Service Providers that you can place on your website or online business on your forms of payment. These icons are available in PNG format in two sizes (99×66 and 64×43). You will also find generic icons payment methods. A blank PSD is also included in the ZIP file. This resource file is free for personal and commercial use. You are allowed to use it in your projects, change it and adapt for your purposes. 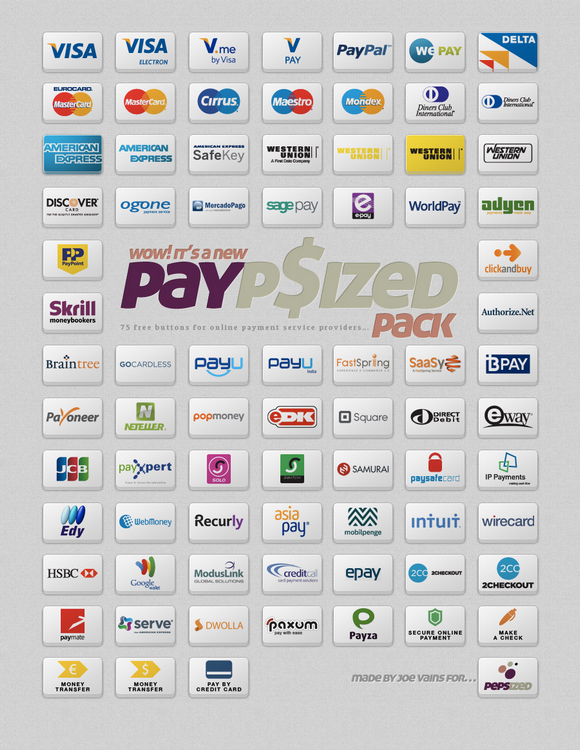 Very large number of payment service icons collection where all icons are incredible.. Huge Collection.